This weekend’s SharePoint Saturday Charlotte was a huge success. It was jam packed with attendees and had a great speaker lineup. Everybody I talked with seemed to have a great time and there were a lot of good discussions outside the sessions as well. I think the overall SharePoint Saturday circuit has been a tremendous success this year helping to bridge the gap between local SP User Group meetings and the larger conferences that many people just cannot afford to attend this year. All of this just goes to show the great distances SharePointers will go to contribute to the SharePoint Community. It really is a great thing to see so many people from so many backgrounds come to together. A big thanks to everyone; Speakers, Sponsors, Attendees, that made it happen and an extra big thanks to Dan Lewis for all the hard work put into organizing it all. The fun isn’t over yet though, there are still a number on the schedule. Be sure to tune into the SharePoint Saturday website. I have been investigating jQuery for about six months now. 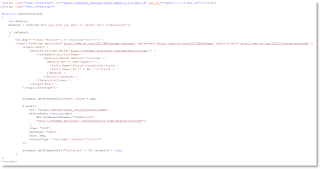 There are some great examples of it out on the Internet through sources like Paul Grenier’s “jQuery for Everyone” series on End User SharePoint as well as Jan Tielen’s blog. Most of the examples I have seen relate to using it to change style and formatting of standard content. It is definitely good at that with its rich selector formatting. In a recent project I hit an interesting snag that was ultimately solved by using jQuery. I had an interesting project requirement for a SharePoint workflow solution where the users wanted to be able to cancel a request by simply clicking a button from a list of open requests. Initially I didn’t expect this to be much of an issue since I had done some DataForms in the past. I ended up finding two limitations to this process though; overriding default values is not easy because the fields are databound, and any changes to any rows are saved on submit of the form. This means that if you do override the field you are looking to change, every row shown in the form would change not just the individual row for the button clicked. My next thought brought me to building a custom web part to do this. In fact this is something I have done many times in the past for somewhat similar requests. This was not a good option though since the rest of the display could need to change frequently and really should be more dynamic and configurable. In the end the cost to maintain this would be too high. I decided jQuery was the best solution for this particular project. It gave me the ability to keep the display as a DataView which is easily configurable, and call a script on the page that can perform updates via a jQuery to SharePoint UpdateListItems web service call. In the end, the code was very simple yet effective. As I get a handle on all of the capabilities, I see it becoming more and more central to my development toolkit. I just sent in the details for my proposed presentation for the Triangle SharePoint User Group’s July 7th meeting. The meeting will take place at TekSystems Raleigh and run from 6pm – 8pm. The presentation is titled Using jQuery to Build a Document Review Application – Intro to jQuery for SharePoint Developers. I will provide an overview of how jQuery can be used to deploy assembly free code to interact with SharePoint through its web services to create feature rich applications. A brief overview of the currently available CAML tools will also be provided. I would encourage anyone in the central North Carolina area to attend, and as always feedback is greatly appreciated. The first release of THE SharePoint PowerShell Module (SPoshMod) is now available on CodePlex. As I mentioned in a previous post, PowerShell is a great tool for SP Admins and Developers to learn. It can really make administration and content deployment tasks easier and repeatable. Take a look and provide feedback to the team! I come from a development background but the past few years I have been at lot more time on system administration with applications like SharePoint. While there are some good command line tools, I am not a great command line scripter. Getting proper code flow when writing batch files leaves a lot to desired when you have the developer’s mindset. Until recently the only alternative was to write .net code which seems like overkill for most operations. I think PowerShell really fits this gap well, providing access to managed code APIs and assemblies while also offering the nimbleness of scripting and interactive sessions. The past month or two I have been working on scripts that can do everything from creating a new web application to deploying solutions and content types. These scripts can make deployment a whole lot easier and more effective. After I get a chance to fully test my scripts I’ll be sure to post them here or on CodePlex. If you have not yet dived in, now is a good time. SharePoint Search can be used to power much more than just ad-hoc searches. The standard web parts are highly customizable and there is also the option to create your own that leverage either the Search API or web services. I really like that the rendering of the results can be completely customized by updating the XSLT. This provides quite a few opportunities for custom uses without having to recreate all the web part’s plumbing. By using the “Fixed Keyword Query” option you can pass in static queries. This is especially powerful when interacting with the User Profiles in MOSS. I have been working through some uses with this to provide a dynamic department lists that link to the user profiles. In the past I have seen groups use the regular contact lists, but then owners have to duplicate all of the people’s information that is already stored and maintained in the user’s profile. When working with very large lists and libraries, this can also provide a simpler, more responsive interface making it much easier for users to find what they are looking for. Spend some time in the sandbox to get a better idea of the available capabilities. I think you will quickly see how they can be applied to your environment and your projects. SharePoint ships with a decent set of Quota Management tools. Many of the people I talk to are not familiar with the tools because they do not believe they need quotas. I think the tools offer valuable information that can be used to help maintain a well run farm even if strict quota management is not needed. Without the tools, you increase the likelihood of excess content being stored which leads to longer backup and recovery times and additional storage needs. If sites really do not need to be limited, I would advocate setting the quota limits very high as opposed to not enabling them or turning them off. 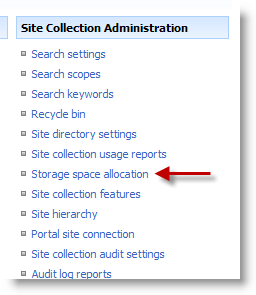 The tools are available to Site Collection Administrators from the Site Settings page at the root of the Site Collection. The tools will list out all of the content in the Site Collection. You can review Document Libraries, Documents, Lists, and the Recycle Bin. Document Libraries – I find it helpful to know which libraries have the most content. By reviewing this list you can get an idea of which Document Libraries to target when reviewing the information architecture and taxonomy issues. This may also provide the information needed to make decisions on restructuring sites and site collections so that they are smaller and nimbler helping to reduce recovery time during disaster recovery. Documents – It can also be informative to know how big the bigger documents are. This report will actually roll in prior versions as well so if there are a large number of versions you can review and clean up as needed. In the prior version of SharePoint it was not possible to set a maximum number of versions to save so I used this to review and manage prior versions. I had one case where there were some financial spreadsheets with over 100 versions at 75mb each. That is just wasted space unless there is a real business need. Lists – List size can be very difficult to figure out without this tool. The number of records is important to know, but if there are attachments the list size can grow very quickly. This report will detail both the number of items, as well as the storage space consumed. Recycle Bin – It will also report out what is in the recycle bin. There is nothing too exciting here. 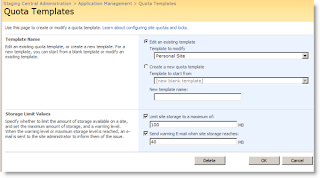 The quota templates are available in Central Administration under Application Management, Quota Templates. If you do not really want to manage quotas you can set this to a large value. If you have a charge back system in place where groups pay for the storage they use, try to identify a few different standard categories and assign a warning and max level. Here are some categories that I have used before. 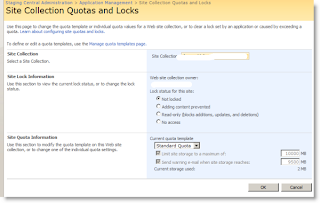 The screen to enable quota management on a site collection is available in Central Administration under Application Management, Site Collection Quotas and Locks. Note: If a site goes over its configured quota it will be set to locked. Even if you adjust the quota size you will still need to remove the lock. Consultant specializing in the cloud and modern digital workplace.